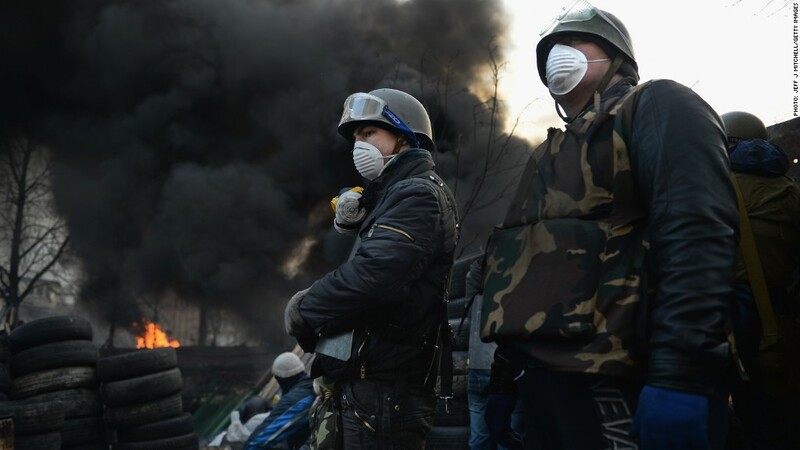 Ukraine's capital Kiev was calmer Friday after two days of violent anti-government protests left at least 78 people dead. Russia said earlier this week it was ready to buy Ukrainian government bonds -- part of a $15 billion financial aid package agreed in December -- but appears to have got cold feet as anti-government protests escalated. The Ukrainian finance ministry canceled the planned bond sale late Thursday. At least 78 people died in clashes between protestors and security forces over the past two days. "It was Russia that refused to buy the bonds because Moscow said [the president] did not have control in his country," said Anders Aslund, senior fellow at the Peterson Institute for International Economics. Ukraine desperately needs the cash because it has to repay as much as $13 billion in debt this year. Three months of political turmoil have left the country dangerously short of the foreign currency reserves it needs to service its debts and pay for imports, including natural gas. It now faces a real risk of default, which would plunge the ailing economy even deeper into the mire. The protests were sparked by President Viktor Yanukovych's decision in late November to strengthen economic ties with Russia and spurn a far-reaching trade deal with the European Union. Moscow stumped up $3 billion in December but further payments have been put on hold due to the political uncertainty. Yanukovych and opposition leaders said Friday they had reached a political deal, including early presidential elections and constitutional reforms, but it remains unclear whether this will end the crisis and unlock financial support. Ukraine is due to repay about $3 billion to the International Monetary Fund in the first half of this year. "Defaulting on this debt would mean shattering Ukraine's image as an investment destination, scaring away investors and effectively shutting down capital markets for Ukraine," said Lilit Gevorgyan, a senior economist at IHS Global Insight. The IMF is one of the few organizations that would be willing to provide an aid package to Ukraine, though it would come with tough reforms attached. Rating agency S&P lowered its rating on Ukraine Friday to CCC, saying it believed Ukraine would default within 12 months "in the absence of significantly favorable changes in circumstances, which we do not anticipate." According to the IMF, Ukraine has been in a recession since mid-2012. Subsidizing natural gas prices for residents has put a severe strain on the country's finances. The Ukrainian currency has fallen by roughly 8.5% versus the U.S. dollar since the start of the year. Earlier this month, Ukraine imposed restrictions on the movement of money out of the country to try to stabilize the hrvynia.